How many times can you look at photos of food arranged on my living room table (yes, you read that right), coffee table or balcony table? Many, judging by how long I’ve been at this. Thought I’d do something a little different today, details to follow. But first I must wax southern hemispherish about how hot and crowded La Vega was today. And that’s on the Sunday of a three-day weekend (assumption of Mary Feast of the Immaculate Conception (Thanks, Frances)). I wisely wore closed-toe shoes, and shuffled very slowly, and did not shout at or step on anyone, nor did I get pickpocketed. All good then. 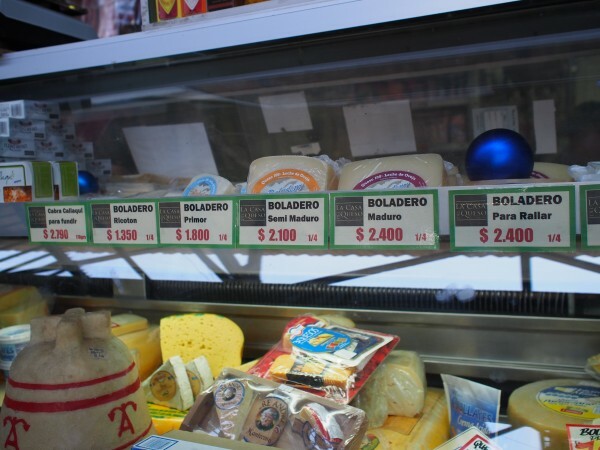 Today’s mission, in addition to the regular veggie-stock up was to find a different good cheese place, recommended by another cheese lover, where they sell the Boladero feta that has revolutionized how I feel about cheese in Chile. Previously I had found this cheese at Colmado (coffee rec, a ojos cerrados, which means just go already), or the fancy Jumbo at Lo Castillo, which is much more upscale than the one at the Costanera Center, evidenced by the presence of this cheese, as well as phyllo, and the street-selling fruit vendors who wanted 3,000 pesos for cherries the other day (see Vega prices below). But now I can go to other places to get that cheese. 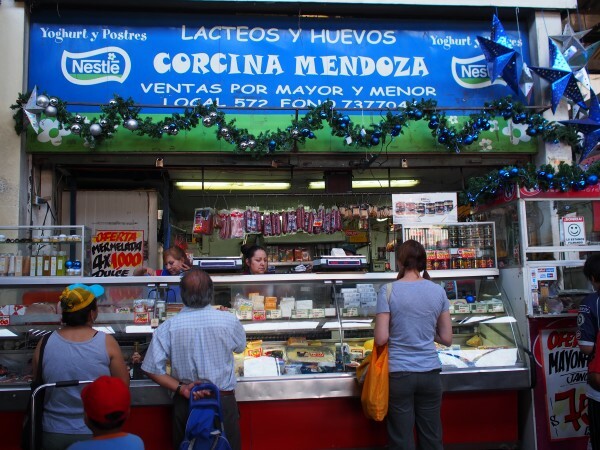 For example, La Vega. First, let’s look at these gorgeous cheeses. Well, that’s a display. You can’t really get anything from that, can you? Cheese from Patagonia, sheep. Tasty, sharp, crumbly when it’s supposed to be. Fuerte. But where to get it? The describing of where things are in La Vega is a bit like playing I spy with a person who has never been in the room you are describing. You know the place with all the peppers? ok, not there. You know the guy with the grey cat who sells the envases (paper packaging)? You know where the pig’s head usually is? Across from there on the south side, near the… It’s a royal pain. One day we will figure out a way to fix this, though I am only partially inclined to, because I kind of like the sleuthing. But in this case, for cheese, I will make an exception. And then behold, get cheese that tastes like what you remember cheese tasting like in the old country, approved by foodies from three countries, USA (not me, a different foodie, who is more of a foodie than I am), France, and Australia. Prices are listed by the quarter, range from 1350 to 2700 ($2.20-$4.41 per 250 grams, or roughly the half pound). Also, as far as I can tell, this is the only feta commercially available that actually tastes like feta. We get a Danish one that tastes almost nothing like feta (not tangy, cow’s milk, etc) that people who don’t know better think is feta. Trust me on the cheese, already, ok? Whereupon I have eaten a giant arugula salad and made blueberry lemon muffins from this recipe, and I have not yet tasted them, but they look fantastic. This is such a good time of year for everything fresh. And cheese. Have I mentioned the cheese? Varieties tried are the Ricotón (like ricotta salata, but sheep), Feta and queso de oveja maduro. (As opposed to queso de oveja madura, which would mean the sheep was old, not the cheese). Grammar lesson=free. Finally my very expensive, Catholic, private school education pays off! The 8th of December is the Feast of the Immaculate Conception. The Assumption is in August. I like your cheese safari. I was supposed to fact check that!!! I will change it, thanks! Hi. A small correction: queso de oveja translates to sheep cheese while queso de cabra translates to goat cheese. how did I even do that? I must be drunk on all the cheese, thanks, Carlos!!! Yes, inexpensive avocados are a luxury! So come visit, already! So how hard would it be for the individual stores to say they are on Pasillo 1 or whatnot? Vamos Chile!! Also, what I really want to know is, with specificity, what they have. So for example, one place will say they have “beans.” But I want to know if they have kidney beans, mung beans, etc, not just beans. In El Galpón del Los Chacareros, there are several vendors that sell semi-unusual items, okra in the late summer, tat soi right now, for example. Or small zucchini or jerusalem artichoke. But on the map, they’d probably just come up as “verduras.” We need a map with someone to screen for good content. Perhaps you are that person?! Perhaps I am?! Thanks for dropping in, Sergio! And now I’m really in the mood for cheese. But I think it might have to wait. To many things going on before christmas. Getting a bit of panic, but just a little. (Finally in Chile though, very happy about that). On the other hand I too love the cheap avokados, my daughters are just crazy about palta right now. They wont have anything else for breakfast, especially if there is bread. It’s a thing that happens to all of us. Chilean avocados at reasonable prices will spoil us all forever! It really do. I remember the days when I thought that the imported avokados I buy in Sweden actually tasted good. As another ex-pat who tries to cook in Chile, have you come across real cream? Like, heavy cream that is just cream, without stabilizers, sugar or “sabor idéntico natural”? I remember when I first came here having to work really hard to find “jugo” without sugar (which is even added to things labeled “100% juice”). People rave about the Soprole in the bag, in the refrigerated section. I have had the best results for making whipped cream from the colun in the box, which is weird, because I don’t like the colun milk in a box. I am not sure of the ingredients in that one though. I would assume it would have stabilizers in it. You can get fresh (pasteurized, but not homogenized)milk at the eco feria in La Reina. Maybe those people would have a line on fresh cream, too. Suerte and thanks for popping in!